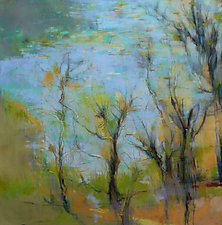 "I work primarily in soft pastels and secondarily in oils, casein, and mixed media. The pastel medium is akin to working with pure pigment and provides a unique spontaneity and richness of color. 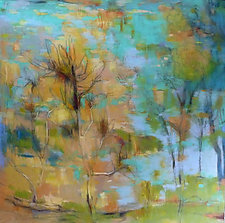 I am attracted to landscapes, architecture, and abstract themes based on nature." 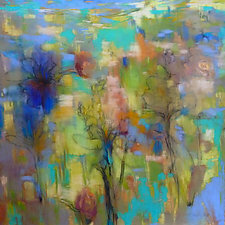 Saturated color and dramatic light are the hallmarks of Victoria Ryan's paintings. The underlying theme of her work is the idea of a heightened reality. She has always been intrigued by dream imagery, and aims to paint images that exist on a slightly higher vibration and elicit a variety of moods and feelings. 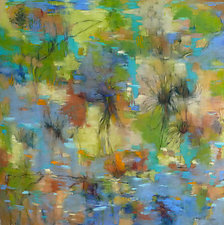 Her abstract work is created through an intuitive process based on the idea of a deconstructed landscape. She thinks of each piece as a page from the sketchbook of the collective subconscious, depicting what the process of perceiving nature might look like. Soft pastel has been Ryan's preferred medium since she first started exploring it in college. Layers of color are applied and some blending is achieved using fingers and blending sticks. She uses only the finest archival papers and prepared boards. Victoria Ryan has also returned to painting in oils, as well as casein, acrylic, and various combinations incorporating charcoal, graphite and oil sticks. Ryan, who lives and works on the north coast of California, received her BFA in painting and drawing from California State University at Long Beach. 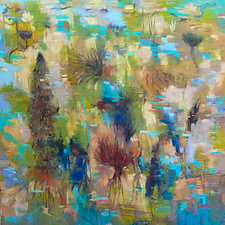 For more than 25 years, she has been exhibiting in featured exhibitions and group shows nationwide. An award-winning artist, her work can be found in public, corporate, and private collections worldwide.